Millennial Magic is dedicated to celebrating the special and exciting qualities that makes someone special and share inspirational content. The Millennial Wives Club got the opportunity to sit down and talk to Girl Boss Jade Renee from Luxx Media Group! This girl is our people, and we were so happy to highlight her knowledge and expertise. We talked society's expectation of women, recipe for success, branding tips, and so much more! Jade is our social media bestie, we loved her content, and we really enjoyed getting to know her story. She dropped a few hidden gems as well. MWC: Give us an overview of the evolution of Jade. How did you become the woman you are today? 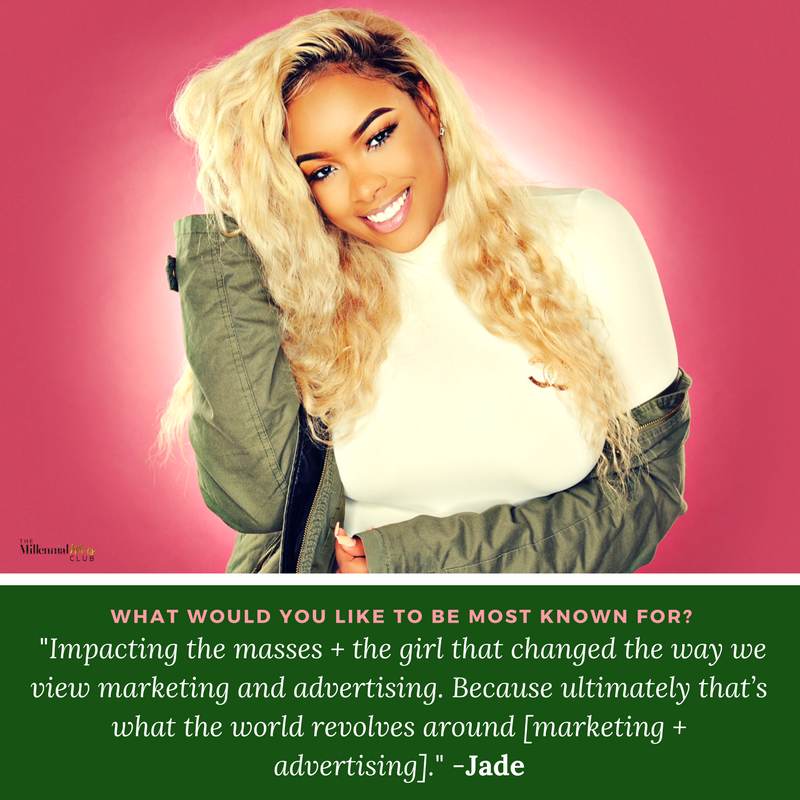 JADE: I started finding out who Jade was in college, after that I really started to take both my personal and professional brands seriously because people were becoming inspired and influenced by my work ethic and then I evolved into Jade Renee. I'm still learning more about myself everyday though. MWC: What inspired your career choice and side hustles? How did Luxx Media Group come about? JADE: I’ve always been passionate about graphic design and marketing. I also have a bachelors degree in Integrated Marketing Communications but I wanted to be a radio personality. I decided to make money doing what I love instead of what I thought I loved so then Luxx Media was born (senior year of college). MWC: As the owner of Luxx Media Group, how do you manage your brand as well as the brands of others? JADE: Honestly, it’s actually extremely hard. I just make it look easy. Dealing with over 1,000 brands a year, I have to truly dedicate time to my brand. If it’s important to you, you’ll quickly find out how to balance. It’s all about staying focused, having discipline and creating balance. MWC: Does appearance play an active or passive role in brand development? Does it trump the actual talent, skill, or quality of a business? Why or why not? JADE: Due to the severity of social media, appearance does play a major part in brand development. That goes for personal and visual appearance. It can only trump the talent if you let it. Example, if you’re a hairstylist I feel as though you should always promote your hair on your own head not just clients. But if you’re a graphic designer per say, you don’t have to have a personal appearance but visually you should be appealing to attract your target audience. MWC: What do you think society expects from Millennial women today? JADE: Society expects nothing but greatness from today’s millennial women. Although that puts a lot of stress on us, I believe it’s still a standard we should set for the next generation. MWC: What is your recipe for success? JADE: It’s really simple. Stay dedicated, consistent and focused. Those 3 things may seem easy but it’s the 3 hardest things to do. Also, always remain true to yourself and your values. MWC: In life, we all come to a point in life where we feel stuck. What moment was that for you and how did you pull yourself out? JADE: I feel stuck almost everyday! It’s never about the situation but it’s always about your reaction. I try to remain as positive as I can when dealing with any situation. So I’m never “stuck”. That’s a mindset. MWC: What would you like to be most known for? MWC: What is your self-care routine? How do you juggle your business and still make time for yourself? JADE: I don’t have a set self care routine. I try to make time when I can to pamper myself. I am for every 2 weeks with hair/nails/etc but sometimes it ends up being a few weeks after. It just depends on my schedule, but I pride myself on my upkeep because I didn't used to do that! I’d be working non-stop while looking like a mad woman LOL. MWC: What are your top 3 essential branding tips? Number 1: Please do not include glitter on any type of logo design for your business. It’s literally the most unprofessional trend out there right now. Number 2: Keep your branding consistent, all products should correlate with one another. Number 3: Invest in the basics! The basics cost little to nothing to look more professional and visually appealing to your audience. The basics include buying a professional email address (info@yourcompany.com), a professional domain name (www.yourcompany.com, setting up a newsletter account (which is free), etc. Thank you Jade for being magical and spreading your magic today with The Millennial Wives Club! You can follow Jade @iamjaderenee.